Home Uncategorized What’s inside 2 Chainz’s Haunted Pink Trap House? What’s inside 2 Chainz’s Haunted Pink Trap House? The Haunted Pink Trap House is open through Halloween. 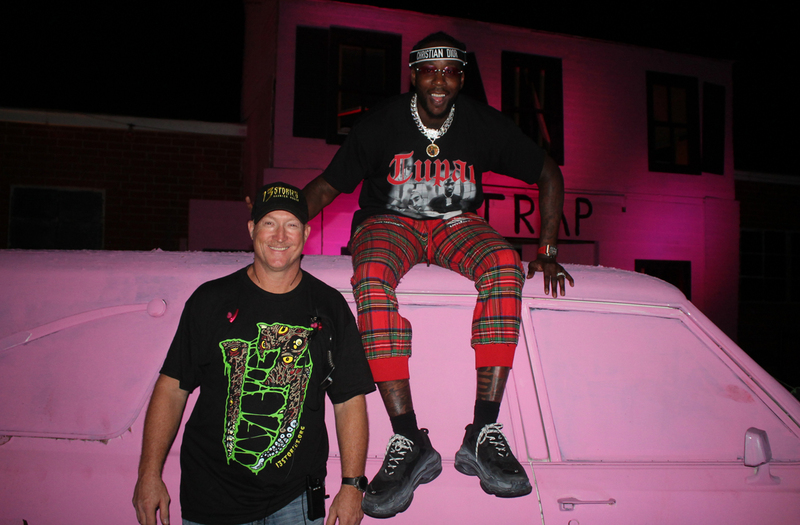 At 2 Chainz’s Haunted Pink Trap House in Newnan, thrill-seekers can fire a fake assault rifle at “zombie crackheads” in a dark, damp trap house. But the limited-time attraction offers far more than a setting to scream and unload lead on undead junkies; it also offers a chance to give back. 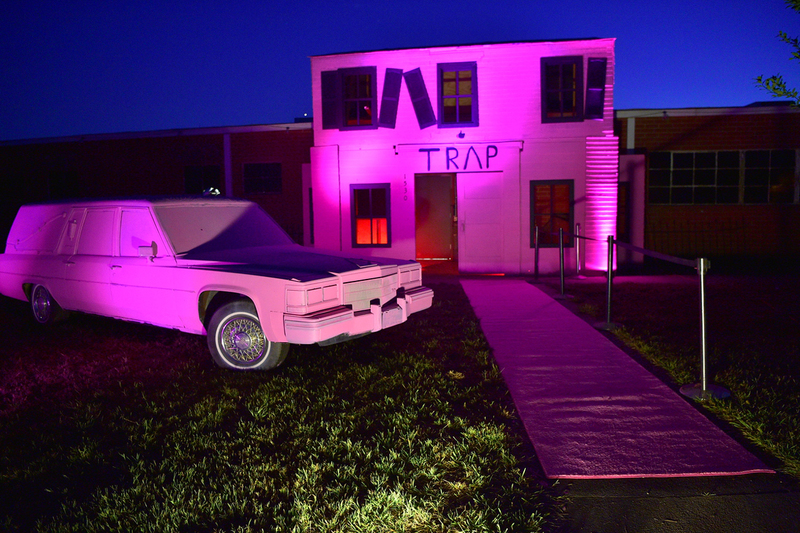 As with the Atlanta rapper’s original Pink Trap House once stationed on Howell Mill Road—a promotion for his 2017 album Pretty Girls Like Trap Music that also offered HIV testing and housed an art gallery—the new Halloween-themed endeavor operates not just to entertain but to support local initiatives helping the less fortunate. On October 28, a portion of the proceeds from the haunted house will go toward breast cancer awareness advocacy group I Will Survive. There are also plans to work with charity groups such as the Boys and Girls Club before the season is over. The three-stage haunt, the result of a partnership between the haunted house experts of 13 Stories and 2 Chainz’ management team Street Execs Studios, takes attendees through what at first seems like a run-of-the-mill horror show, replete with disorienting bursts of pressurized air, aggressive animatronic ghouls, and blood-curdling shrieks. (Spoiler alert, for those who don’t what to know what happens next.) But then comes the crack cocaine cook site, a dingy kitchen full of pots and pans encrusted with the white cake of illegal street drugs—not to mention mad scientist types covered in blood. The whole ordeal is complemented by injections of trap music, which, at times, is drowned out by live actors uttering daunting promises of death. The second phase of the adventure, dubbed the “Apocalypse Zombie Kill Experience,” yields visitors a full-metal toy gun, which comes loaded with 150 [imaginary] bullets. Soon after clearing the trap kitchen and picking up the heavy gun, a horde of live “zombie crackheads,” as Allyn Glover, owner of 13 Stories, describes it, stalks after visitors and accosts them at every turn. Assuming attendees make it out alive—these zombies take more than a single headshot to put down—they’re then thrust into pure paranoia, cast as undercover cops in a hostile drug den. Inside a dimly lit room, an abundance of “cocaine” decorates a table in a snowy smattering. Bricks of white powder wrapped in plastic are stacked against the wall. A purported drug dealer, barking orders after outing visitors as narcs, forces them to face the wall while he wraps a blindfold around their eyes. In pure blackness, the “cops” are sent off to wade through a sea of pokes, prods, and electric shocks—really—from, presumably, “trap stars” (actors, of course), weaving though skinny corridors leading to, hopefully, the exit. Glover says that his company and 2 Chainz’s record label teamed up in an effort to show how scary the trap life can be—with lighthearted twists. For decades, he said, haunted houses have glorified murder and mayhem through a theme park lens. Rarely—if ever—is dangerous drug culture exhibited in the same manner. With, of course, some zombies and skeletons added in. 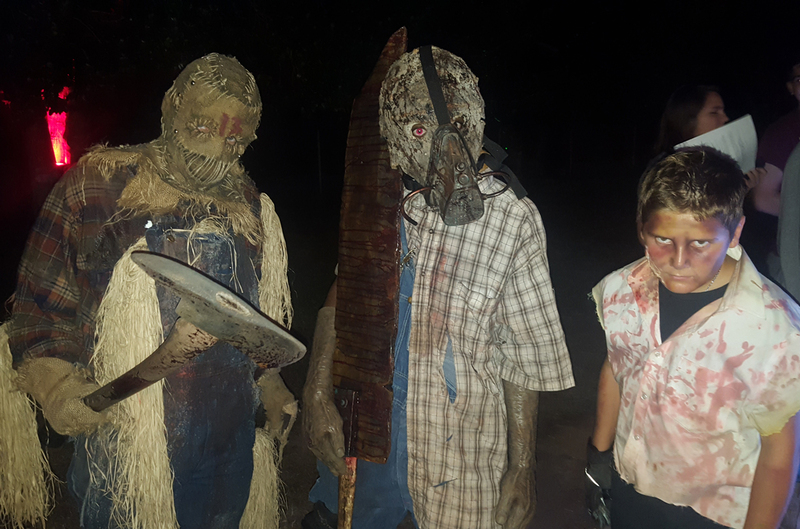 The Haunted Pink Trap House is open every Wednesday through Sunday through October 25, October 26 through November 4, and November 9-11 at 320 Temple Avenue in Newnan. Tickets start at $22 (plus fees) can be purchased in advance here.